Though she secretly dreams of working out with Bob Harper, our Blogger On The Run is one fierce female who runs with a passion. WR: How would you describe yourself? 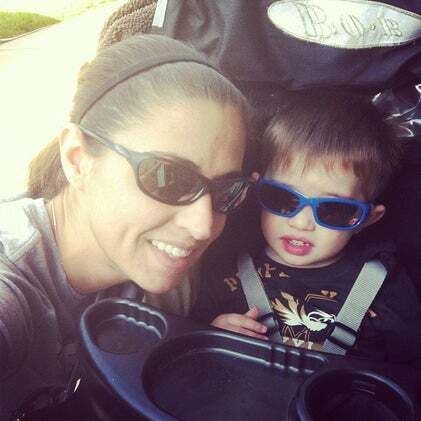 K: Fun-loving, focused, supportive mom — I love to challenge myself to be the best I can be! Check out Katie with her best running buddy! WR: How did you begin running? K: I started running after college ended. I was a college volleyball player and needed a way to stay in shape. I loved the feeling of accomplishment I had after my first run, it was slow and short but it didn’t matter, I was hooked. I ran my first 5K in 2004 and I’ve been running ever since. WR: What keeps you running and training? K: Running and training are lifestyle choices for me now. I do it because I love it and it’s just part of my day. It’s something my husband and I do together so it’s important that we keep that connection too. WR: What type of run is your favorite? K: I actually love interval training. I have a short attention span so intervals allow me to focus in short bursts. Plus I would love to get faster and intervals let me work on that. WR: What’s your favorite race memory? K: That’s a tough one. There are so many. I remember crossing the finish line of my first half and full marathon. I cried like a baby. But I think my favorite race memory is less than a week old now. Crossing the finish line with 11 other girls (and a couple amazing guys) at Hood to Coast has to be it. I loved the team aspect of it. I loved connected with all these amazing people and knowing we pushed each other through. I’ll never forget it. EVER! 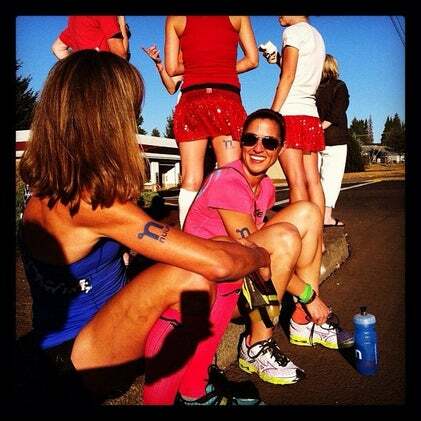 Katie enjoys a break from the 2012 Hood to Coast Relay Race. WR: How do you reward yourself for accomplishing your training/running goals? K: After I achieve any goal, I like to do something for myself. Sometimes it’s new workout clothes. I find doing that makes me more motivated to hit the gym. Sometimes it’s a massage and sometimes it’s just a nap. Whatever it is, I think it’s super important to do something. Kind of brings closure to one goal and lets you move on to the next. WR: Best running advice you’ve received or given? K: Run for yourself and your goals. Everyone else is doing the same thing. Check back each week for a new Blogger On The Run! Want to read more? Head over to Mom’s Little Running Buddy now! Katie dreams of running with celebrity trainer, Bob Harper. If you could run with anyone in the world, who would you choose? 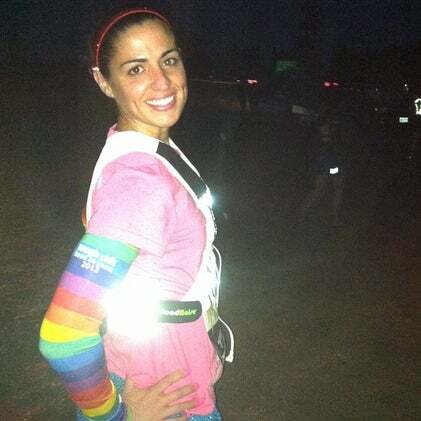 We love our Women’s Running magazine Blogger On The Run so much that we want to inspire you to check her out! Simply leave a comment below telling us what you think about Katie’s story and you’ll be entered to win a one-year subscription to Women’s Running magazine. Winner will be announced on tomorrow’s post, so check back then to see if you won. Don’t wait – enter now!